You know, with the announcement of the new TMNT cartoon series, we've learned that is this series, which has a more mystical bent in it's themes, we will have foot soldiers who are basically golems made of paper, whom the turtles can freely hack, cut, and slash their way through, decapitating and maiming endless numbers of the foot, without having actual people die. Like the robot foot soldiers before them, most people hate this idea. They claim it 'censors' the turtle's violence, and while this is true for the cartoons, I believe the origami ninja would be a perfect fit for a more series, live-action TMNT, as well. Think about it... we all love seeing the turtles take on giant swarms of foot ninja, ridiculous numbers of these gut that get cut down during a total fight, only to have large numbers of foot ninja re-spawn later in the movie, seemingly out of nowhere. I don't think an elite ninja clan is goign to allow large numbers of New Yorkers to join. That's why I think the origami ninja could be a BRILLIANT IDEA; created through a mystical Kuji-kiri ninja 'spell' the origami ninja serve as the lowest rung cannon fodder, while the foot lieutenants and everyone higher up the foot's command structure are 'flesh and-blood people. That way, it has more meaning when the turtles cut down a LIVING foot soldier, but you can still have the mook swarms. This is at least, my take on non human foot ninjas, like robots and magical origami FOOT NINJAS. I think they have their place in TMNT, and can be an interesting story element, and not just censorship. There are still human Foot in Rise though, they're the ones who make the Origami ninja. They're more like Foot Mystics. I like this more then robots, at least sits closer to the perception of ninja and the Turtles can go all out. The robots in 2012 was a necessary evil giving us sine pretty brutal fight scenes. Agreed. Ninja using mystical abilities has a more 'martial arts' feel to them, and the origami ninja, being mystical, is abetter fit to the genre than robots. The robots in 2012 was a necessary evil giving us sine pretty brutal fight scenes. No neeed. Those more fights could be fought against the Kraang, as the Krangdroids allowed great action. Foot robots make most sense in the MWS series and Archie comics, combining the cooperation of Shredder's Japanese martial arts and Krang's extraterrestrial technology. I was always humored by the serious life-or-death tone the 4Kids series tried to convey and the fact that all the waves of Foot Soldiers had to be defeated by apparent knock outs via kicks or punches with the hilt of bladed weapons. I find this concept pretty interesting. Chien Khan's white ninjas in the Archieverse would disappear into thin air when hit. Chien Khan's black ninjas could jump from tall skyscrapers and survive land safely on their feet. Dang, I gotta try to use those in my D&D game. I am so throwing those into the Oriental Adventures portion of my campaign! yeah, I'd like to see the origami ninja carry over into other mediums, and into films. It would allow the TMNT to totally cut loose with their weapons in aPG-13 film. The deaths of human ninja commanders at the turtles's hands can be less violent. Even in a PG-13 production they'd allow for massive swarm battles and much more hero-induced damage than with fleshy ones. Maybe robot ninja would be more elite than the golems, meaning that robot foot could be small-time commanders as the swarms of golems are finely diced to mere ribbons. Golems of various substances would be neat to see, to make them change strategies. Think about it... we all love seeing the turtles take on giant swarms of foot ninja, ridiculous numbers of these gut that get cut down during a total fight, only to have large numbers of foot ninja re-spawn later in the movie, seemingly out of nowhere. Sounds completely toothless and meaningless. Only as toothless and meaningless as the Jedi chopping through endless armies of battle droids on the clone wars series, yet that's still entertaining action. 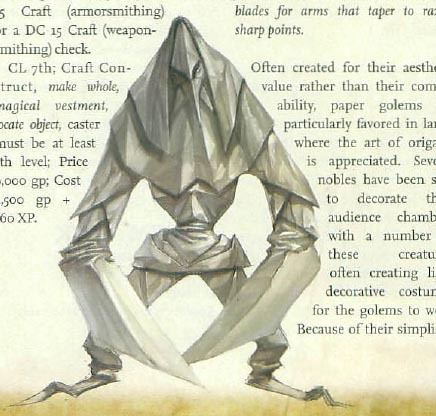 Or any D&D campaign where you chop through armies of stone golems, paper golems, brick golems, and other types. Take Samurai jack; due to the censors the first several seasons had bloodless battles, with Jack fighting robots, aliens, and monsters. Those were bloodless battles, yet they were all awesome and exciting, because Jack's life was still in danger. And when the final season really did cut loose with Jack actually killing PEOPLE, it had more impact because he had never killed a person before, and it caused him trauma. The turtles fighting an army of lifeless soldiers can be an awesome action battle, as long as they face living opponents, too. Not every battle needs to be agaisnt living opponents. And may I add in the mirage turtles have faced robots and non-living opponents, like the king of thieves statue? Only a few of them would be toothless and meaningless, but entire swarms sent to wear them out? Meaningful. They could also be used to make the kills of human Foot more impactful, and perhaps make them seem more like abominations to the Ninja Code. From a resources point of view it makes sense that the villains would have an endless supply of robot soldiers if the TMNT went through about ten human soldiers a day or a week. It just seems obvious to me when I look at it from that point of view.